Three Bristol City footballers including Wales international David Partridge have been questioned by police over an incident in a nightclub. Mr Partridge, 26, and his teammates Scott Brown, 20, and Bradley Orr, 23, were arrested on Wednesday on suspicion of violent disorder. They were questioned and later released on bail pending further inquiries. 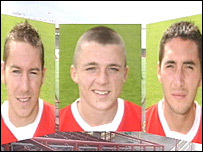 Bristol City Football Club said the trio had been dropped and fined for breaching its code of conduct. The players have been fined two weeks' wages for breaking the club's disciplinary rules. They have been given a final warning about their behaviour and ruled out of the team's home game against Tranmere Rovers on Saturday. City manager Gary Johnson said: "I will deal with any breach of club discipline with a heavy hand... I have left all the players in no doubt that there must be no repeat."